This is a Rhino 3D Tutorial pertaining to Double Curvature Surfacing. This is super useful for product and industrial design modelling. 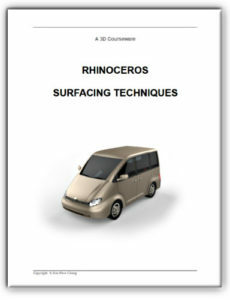 To purchase Rhinoceros Surfacing Techniques Book via Amazon, click below. Here at Studiorola, we are also able to provide advanced Rhinoceros Modelling Training. Call or whatsapp us at +65 97101546 for a discussion or quotation.